Line an 8 inch by 8 inch by 2 inch pan with tin foil. Spray foil with cooking spray. Cut butter into pieces. Place the butter into a large microwave safe bowl and melt it in microwave. With a whisk, blend in unsweetened cocoa. Add sugar and mix well. In another bowl lightly beat together eggs and vanilla extract. Add egg mixture to the cocoa mixture and blend together. Pour into prepared pan and bake for 30 minutes. To test for doness insert a wooden toothpick into the center of the brownies; it should have some moist crumbs attached to it. Do not over bake. Remove brownies from the oven and cool completely on a wire rack. Flip the brownies onto a wire rack and peel away the foil. Flip brownies onto cutting board to cut. Wrap in plastic wrap and store in an air tight container at room temperature or in the refrigerator. Kathy, so sorry I haven’t stopped by in awhile. I am adding you back to my blogroll (I somehow lost you when my blogroll was transfered) Glad to see you are still showing people great recipes and how they can do them in their own kitchen! Hi, I love the brownie recipe.I have been cooking and collecting recipes for over 30 years.This recipes turns out great everytime and there is no messy pan to clean up and no greasing and flouring.I’m teaching my Grand-daughter who is 8 to bake, this is simple enough for her to do with help and tastes great . Thanks Everyone! I really appreciate the kudos! There are tons more videos and photo-tutorial blog posts in the works, so stay tuned! Thanks Everyone! It is really great to hear all these wonderful things being said about startcooking.com! Hi David, Thanks for sending the photos of Matthew and Charlie helping to make the Chocolate Fudge Brownies! Charlie looks like he could become your official taste-tester! Your videos are really simple and straightforward. I’ve also just seen one of your recipes and they are fantastically simple! Hi Robert! Yes startcooking.com is all about keeping it simple and tasty! Thanks for visiting and leaving a comment! How might you adapt this recipe to include peanut butter? Katie, here are two peanut butter brownie reicpes that look really delicious! Hey, there. I have to admit that this is an amazing web site! It offers simple, yet astoundingly delicious recipes. i just wanted to ask, is it okay to replace sugar with honey to add a different taste? or perhaps half of the measurement of the sugar and the rest with honey? because i tasted before brownies that tasted like honey with cashew nuts. thanks a lot. Christina, substitutions in baking are tricky even for experienced cooks. Substitutions in savory dishes like soups and stews are much easier. This brownie recipe was tested countless times to make sure the ingredients and amounts worked. I have never tried this recipe using honey instead of sugar so I am not even going to try to guess what the proper substitution should/would be. If you do some experimenting, be sure to let us know how it turns out! Made these chocolate brownies last weekend. They were just what I was hoping for: so moist and chocolaty! I have to let you know that I’m a beginner cook, so after botching one batch (the brownie came out soooo uneven in thickness when I used the aluminum foil – maybe it’s just me), I succeeded in making the delicious brownie. I skipped the vanilla extract because I didn’t have it handy and I added chocolate chips (although they ended up on the bottom of the pan). I will be making these again and again! Love the site by the way, Kathy. Makes me want to cook all the more! Thanks Annette! I tried many variations of this recipe before finally settling on this version. I kept bringing brownies to the gym and asking everyone which ones they liked best. Everyone loved trying them but it always led to more time on the treadmill! Good luck with all your future batches of brownies! How much butter would I use if it was in grams? And, is it possible to substitute the butter with margarine? I would NOT substitute the butter for margarine in this recipe. 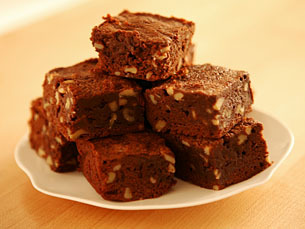 Here is a brownie recipe that does not use any butter, just vegetable oil. Given you have a convection (fan) oven, the cooking time and temperature will most likely need to be adjusted. Here is some basic information to help with the conversion. Hello from Mexico. Thank you so much for that wonderful receipe ! First time my brownies don’t look like a “volcanoe” after they are cook. I did them yesterday and I love this receipe, again thank you very much ! I’m in South Africa, so for those like myself who dont use the same settings as the USA, I used 200g butter, and set my oven to 180º. Thanks, Kathy, your videos have inspired me to try new recipes (and I’m a terrible baker!). I’d love to see a recipe for seseme snaps…as simple as it is, I always mess it up! I prefer to measure by weight and not by volume, but here in the USA – measuring by volume is the standard. Baking does require precise measuring which is why some people find it a bit of a challenge! I’m not sure what “seseme snaps” are? I’m guessing some sort of cookie? I’ll do a bit of research and add that to the ever growing list of recipes to make and photograph. I hope your brownies turned out well!! Thanks, Kathy, the brownies came out perfect!! For halloween I’m going to pipe some white webs on the top with icing for a little twist. There is a photo of my brownies in my blog under the title “Chocolate Brownies” I havent linked to your recipe though, because I want this to become my “Secret Dessert” that everyone clamours for haha so thanks for helping me get an Easy-to-Make Secret Recipe! I am delighted to help! I hope your Easy-to-Make Secret Recipe is a HUGE success! the photo of your Brownies looks fabulous! I made these brownies with an unusual type of coco. I also added a little more vanilla extract. It had a unique flavor that was really moist and delicious! Please let us know what kind of cocoa you used in the brownies! You can’t keep something like that to yourself. hi kathy..i’m Suhana and i’m from Singapore..i have to say that i have been trying A LOT of brownie recipes and none has been repeated….until i found yours…it’s SO PERFECT,..i dont wanna look at another…my kids and nephews just loved them so much…not forgetting myself!…i just love it when u can find a recipe that works as well as it looks…so keep it up kathy!….i’m waiting for more new videos from u…and my 2 girls have named yours as their favourite easy-to-achieve cooking video ever! Hi Kathy, i was thinking, instead of using cocoa powder, can i substitute it with milk powder instead? In a word – no. This recipe is for chocolate brownies and the cocoa powder is an essential ingredient. Hi Kathy! I love your videos, they are well explained, fun, and make cooking look so easy! I live in Venezuela and don’t know where to get cooking spray, I’m sure I haven’t seen it lately in any grocery store. Can you provide me another way to avoid sticking? Cooking spray is a quick and easy way to “grease” a pan so that nothing sticks to the pan. You can use shortening or butter or a very thin layer of vegetable or canola oil instead of cooking spray. Thank you Kathy. I just happened to review your podcast on ITunes (I usually download news & politics) and happened to look at a couple of your recipes. Great job! I have been afraid of omelets because they NEVER turn out right. I see that one problem is the pan. Gotta get one of those with the slope sides for one thing. Wow, I could just go down the line you make it look so easy and fun! I love cooking but with your tips I will now go outside of my comfort zone. Great tip to line the pan with foil. Another great recipe!!! I made these today and they were absolutely divine! All our previous brownie recieps turned out tasting like chocolate cake but finally – we got brownies! My family loved them! Also, I was wondering if there was any way you could outline the nutrition facts for these brownies – for example: the calories, fat content etc. hehe trying to watch my diet! I am delighted to hear that your family enjoyed my brownie recipe! All really good brownie recipes include way too much butter and sugar but that’s what makes them so good! The Nutrition Data link on my home page will help you figure out the nutritional value (if there is any!) in brownies. Learn how to make chocolate fudge brownies with startcooking’s new recipe video. Your friends and family will enjoy this delicious treat. Chocolate brownies are everyone’s favorite. So get to work. Cheers!